Even in the best hotels, things go wrong occasionally. Patience, persistence, and smile go a long way toward getting results when you have a valid complaint at a hotel. Make sure you can explain the problem clearly and concisely. Don't exaggerate; be honest and tell it like it is. Get evidence if you can. A photo snapped with your cell phone can be a powerful image. If it's just a small annoyance, consider letting it slide. Life is short, and that goes double when you're on vacation. Save yourself some stress by picking your battles, keeping your sense of humor and being flexible when faced with a minor issue you can live with. Before you complain, figure out what your expectations for a solution are. Do you need something fixed in your room? Need a new room assigned? What's your timetable? Be realistic about compensation for problems. You shouldn't pay for services you didn't receive. But you are unlikely to have your entire stay comped because one thing was not working in your room. One helpful approach is to tell the manager that you are not looking for compensation, you just wanted to let him/her know there is a problem so it can be addressed. Complain as soon as you know there is a problem. Don't wait until the next day or when you are checking out. Still, if there's a long line at the front desk and all the phones are ringing, you may want to delay until a quieter time so attention can be paid to your problem. Don't call the front desk with your problem. Go down in person and talk face to face. Explain the situation and let them know what your expectations are. Keep your story short and to the point. Be polite and calm. Even if you feel frustrated or angry, never raise your voice or lose your cool. A smile goes a long way toward helping people want to help you. Losing your temper will make the situation worse, and may even get you escorted out of the hotel. Tell your story once, without exaggeration or drama ("My whole trip is ruined! "), and what you'd like done about it, and wait for a response. You should be able to determine fairly quickly if the person you are speaking to is willing and able to fix the problem. If not, ask for the manager on duty or GM (general manager). Calmly and candidly explain the situation to the manager and what you would like done. Let them know who else you've talked to and when. In many cases, the situation can be resolved right away. 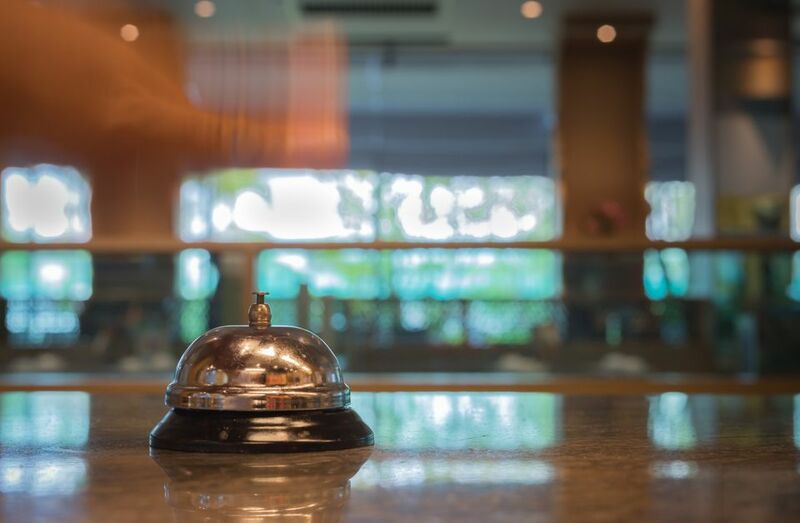 Hotel staff are in the customer service business, and for the most part, they want you to be satisfied. Keep in mind that some problems are beyond their control, and some take time to fix. If you have a specific time frame (e.g., you have a dinner meeting and need to use that broken shower); ask them for a backup plan (use of a shower in another room or in the spa). If you are speaking to the right person (the one with the power to fix the problem), and they seem unwilling to do so, ask again, and then a third time. Remain polite and keep your cool, and be persistent in stating your need for a solution. If they can't offer the fix you requested, consider any alternate fixes they've offered with an open mind. Is it really going to ruin your entire vacation if you don't have a view of the pool as you imagined? Keep your sense of humor and focus on the positives. It's best to resolve the problem when you are still at the hotel. If for some reason they can't fix the problem to your satisfaction while you are in the hotel, keep notes of what happened, who you talked to, when, and what was said. Once at home, you can dispute the charges with the credit card company (always pay with one) and write a letter to the General Manager of the hotel. You should expect a reply within a couple of weeks with an apology, a partial refund, or an invitation to return to the hotel at a reduced rate in the future. If the hotel is part of a chain, don't escalate your letter writing to the CEO unless you are unable to get a satisfactory response from the hotel staff. Even if you have a complaint, remember: hotels (and the people who work in them) aren't perfect, and things go wrong more often than any of us would like. If you find a hotel that solves your problems efficiently, show them your appreciation by becoming a repeat customer.